Updated: see November 7, 2008. Background update, Omar Khadr. Gail Davidson / Lawyers Against the War, at the Night's Lantern LAW Archive. Omar Khadr is a Canadian citizen, born 19 September 1986 in Ottawa, Ontario. Presently 18 years of age, he was captured in July 2002 in Afghanistan when he was 15 and has since been in the custody of the U.S. Armed Forces. When taken captive he had shrapnel wounds to several parts of his body including one to his left eye that has resulted in the loss of most of the vision of that eye. He was transferred to Guantánamo Bay in November 2002 where he is still imprisoned under the purported authority of the order by President Bush made November 13 20011 coupled with Bush’ February 7 2002 order2. In June, White House counsel Alberto Gonzalez warned, “Those select few make their way to Guantámano for development of their intelligence value.”3 Omar has never been formally charged and the allegations against him relate to events that occurred when Omar was 15. “[Each prisoner] lives in a separate cell that is 6 feet 8 inches by 8 feet and, as a general rule, is allowed out of the cell three times a week for 20 minutes of solitary exercise, followed by a 5-minute shower… There is a separate detention facility at Guantánamo called Camp Iguana, reserved for detainees under the age of sixteen that is modified to meet the needs of juveniles. Petitioner [Omar] has never been housed at Camp Iguana. The respondents [George W. Bush et al] explain that this is because he did not arrive at Guantánamo until after his sixteenth birthday.”8 (Memorandum Opinion of John Bates J. October 26, 2004, page 6). Khadr’s daily conditions are worse. According to information provided in August 2005 in the U.S. habeas corpus action, Khadr is allowed an exercise period every 4-5 days, usually at night and once at 2:00 a.m., air conditioning continues to make his cell ‘freezing’ cold 24 hours and lights are kept on 24 hours a day. Documents report that the cold is destroying Khadr’s lungs; he experiences shortness of breath and lack of oxygen. Cell lighting consists of one ceiling-mounted fixture fitted with three florescent tube bulbs. Detainees are reportedly punished for trying to cover the lights9. At Guantánamo Bay prison U.S. Armed Forces officials have held Omar “virtually incommunicado”—no access to outsiders and in solitary confinement for over 3 years. Khadr was not permitted any contact with a lawyer until November 2004.
exposed to continuous electric light in his cell. he has found partially dissolved tablets and/or powder at the bottom of a glass given him by his captors. He says the pills produce various effects -sleepiness, dizziness, alertness11. Khadr suffers from depression, persistent body pain, loss of vision in his left eye, blurred vision in his right eye, shortness of breath, the sensation of being unable to get enough oxygen and a ‘significant mental disorder’ attributed to his treatment during detention. He has difficulty breathing and stomach problems which he attributes to the food..13. Omar was first allowed contact with a lawyer in November 2004 when a U.S. lawyer authorized by the U.S. administration to act for Khadr visited him over a period of 4 days. The lawyer administered the Folstein Mini Mental Status examination to Khadr, and subsequently filed in the O.K. v George Bush et al proceedings, the report of Dr. Eric Trupin. Protest conditions in Camp 5. Khadr said, “It’s destroying us slowly.” He said most people in Camp 5 have some kind of health problem. Protest the military’s disrespect of Islam. Air conditioning to Khadr’s cell was cut off when the hunger strike began16. The detention, the daily living conditions, the interrogation techniques and the punishment of Omar Khadr are all illegal and violate Canadian law, international human rights law and international humanitarian law. U.S. refusal to allow Canadian consular officials to visit Omar Khadr also violates the Vienna Convention on Consular Relations and the rights of the Canadian government to provide assistance to imprisoned nationals. The U.S. failed to give the Canadian government timely notice that Omar Khadr had been taken captive and was in detention; and has, refused to allow Canadian consular officials to visit Omar Khadr. This refusal continues at the date of this memo on September 15, 2005. The U.S. courts have failed to accord any rights to Omar Khadr. They have also refused to restrict the U.S. Armed Forces maltreatment of him. In spite of the June 2004 ruling by the U.S. Supreme Court in Rasul v Bush affirming the right of Guantánamo Bay prisoners to challenge the lawfulness of their detention and the conditions of their imprisonment in U.S. courts, the U.S. Administration, through their Departments of Justice and Defense, continue to defy the law and to deny all rights to Khadr and other Guantánamo Bay prisoners. “On July 7, 2004, nine days after the issuance of the Rasul decision, Deputy secretary of Defense Paul Wolfowitz issued an Order creating a military tribunal called the Combatant Status review Tribunal (hereinafter “CSRT”) to review the status of each detainee at Guanatanani Bay as an “enemy combatant” as used by the respondent.”17 Khadr was subsequently confirmed as an enemy combatant by this extra-legal procedure. Khadr signed a notice discharging his U.S. lawyers and the notice was filed September 14, 2005. The time for Khadr’s two U.S. lawyers to respond to this notice was extended to October 17, 2005 by order of Judge Bates in order to give one of the lawyers time to visit Khadr. Khadr signed a declaration on October 4th 2005 stating that he wanted to continue to be represented by Richard Wilson and Muneer Ahmad of Washington College of Law. Khadr declared that this statement was true, “under penalty of perjury under the laws of the United States of America”! Khadr has now been charged (November 2005) with several offences including murder, on the eve of confirmation that U.S. Supreme Court will adjudicate on the legitimacy of the military tribunals created by Bush’s November 13, 2001 edict.19 The Pentagon has said that they will not be seeking Khadr’s execution and the Pentagon has announced that Khadr will be tried by military tribunal created by the November 13, 2001 Presidential edict. The allegations underlying the charges apparently arise from the July 2002 ground and aerial armed assault by U.S. Forces on an Afghani residence during which a member of the U.S. Armed Forces was killed, along with an unknown number of Afghanis, and Khadr was taken into custody. The military tribunal process by which the U.S. intends to try Khadr, has been universally criticized as an extra-legal process that violates basic international fair trial standards. 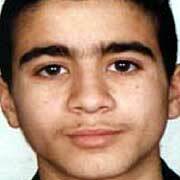 U.S. officials are reported to have agreed that Khadr will not be executed. When Amnesty International called on the Canadian government to rescue Omar Khadr from Guantánamo Bay, the Canadian Department of Foreign Affairs--DFAIT stated that they became aware of Omar’s detention by American forces in Afghanistan in mid August of 2002 and had sought to provide him with ‘appropriate assistance’.20 The available evidence belies the veracity of this claim. In an action before the Federal Court in Canada21, lawyers acting on behalf of Khadr are seeking orders compelling the Canadian government to extend certain services to that would protect his rights orders prohibiting the Canadian government from questioning Khadr or otherwise assisting the U.S. in prosecuting him. (Khadr v DFAIT) These lawyers have not been allowed any access to Omar despite requests by the Canadian government. In fact DFAIT, as the respondents in action in the Federal Court of Canada, take the position that the Canadian government owes no duty to Khadr and has participated in further violating Khadr’s rights. DFAIT does not dispute that, on at least 2 occasions over at least 4 days, DFAIT and Canadian Security Intelligence Service (CSIS) officials visited and interrogated Khadr at Guantánamo ostensibly to extract information from him that officials thought might be useful in advising the government of Canada on national security issues. DFAIT and CSIS then provided summaries of those interrogations to U.S. authorities as well as to the Royal Canadian Mounted Police (RCMP). that, as of August 8, 2005, the U.S. continued to refuse proper consular access to Omar Khadr by Canadian consular officials. 1. President George W. Bush, ‘Detention, treatment and trail of Certain non-Citizens in the war Against Terrorism’, 13 November 2001. 2. George W. Bush, Memorandum on ‘Humane treatment of Taliban and al-Qaeda detainees’, 7 February 2002, para. 2(b). 3. “Press briefing by White House Counsel Alberto Gonzalez”. Office of the Press Secretary of the White House, 22 June 2004. 9. Muneer I. Ahmad, Richard J.Wilson, Counsel for Petitioner O.K., August 9 2005. 10. Memo William J. Haynes II, General Counsel, Department of Defense, November 27, 2002 for Secretary of Defense Rumsfeld, 2 December 2002 and re-confirmed April 16th 2003. 11. Declaration of Muneer I. Ahmad, 21st March 2005. 12. Composite Statement: Detention in Afghanistan and Guantánamo Bay. Shafiz Rasul, Asif Iqbal and Rhuhel Ahmed, page 109. 13. Muneer I. Ahmad, Richard J.Wilson, Counsel for Petitioner O.K., August 9 2005. 14. Paragraphs 19-27 of the Declaration of Eric W. Trupin, Ph.D. filed in the U.S. habeas corpus proceedings, O.K., et al v. George Bush, et al. 15. The Guantánamo Prisoner Hunger Strikes &Protests: February 2002 – August 2005 A Special Report By the Centre for Constitutional Rights, page 12. 16. Muneer I. Ahmad, Richard J.Wilson, Counsel for Petitioner O.K., August 9 2005. 20. Letter from HG Pardy, Director General, Consular Affairs Bureau, Department of Foreign Affairs, December 30th, 2002. 21. Omar Ahmed Khadr by his Next Friend Fatmah El-Samnah v. The Minister of Foreign Affairs, Federal Court Trial Division, Court File No. T-686-04..
22. Omar Ahmed Khadr by his Next Friend Fatmah El-Samnah v. The Queen, 2005 FC 1976, The Honourable Mr. Justice von Finckenstein; Reasons for Order and Order, August 8, 2005, page 11.